Jason Kubel's expected departure became official yesterday, as he agreed to a two-year, $15 million deal with the Diamondbacks. Kubel has been a solid player and should thrive moving to the NL and Arizona's hitter-friendly ballpark, but he's also a 30-year-old should-be designated hitter with a modest .259/.327/.430 line during the past two seasons and the Diamondbacks already had a younger, cheaper, and arguably better all-around left fielder in Gerardo Parra. Kubel had a standout 2009 season, hitting .300/.369/.539 with 28 homers at age 27, but was otherwise a pretty ordinary corner outfielder/designated hitter. He hit .271/.335/.459 overall in 753 games for the Twins, who refused to platoon Kubel and gave him more than 25 percent of his career plate appearances versus left-handed pitching despite a measly .239/.313/.365 line against southpaws. Kubel's production (.271/.335/.459) is nearly identical to Jacque Jones, who hit .279/.327/.455 in 976 games for the Twins and also should have been platooned, with the difference being that Jones was an outstanding defensive corner outfielder who would've played center field if not for Torii Hunter's presence. Kubel was far from a butcher in the outfield and had a strong arm, but lacked the range to be anything but below average. Of course, that wasn't always the case. Kubel was a very promising prospect, hitting .352 with 22 homers, 42 doubles, and nearly as many walks (53) as strikeouts (59) in 127 games split between Double-A and Triple-A as a 22-year-old in 2004. He even stole 16 bases, played some center field, and ranked 17th on Baseball America's annual list of MLB's top prospects. And then a brutal outfield collision while playing in the Arizona Fall League wrecked his left knee. Kubel tore three ligaments, missed the entire 2005 season, and came back as a shell of his old self in 2006, hitting .241/.279/.386 in 73 games for the Twins while displaying below average speed. 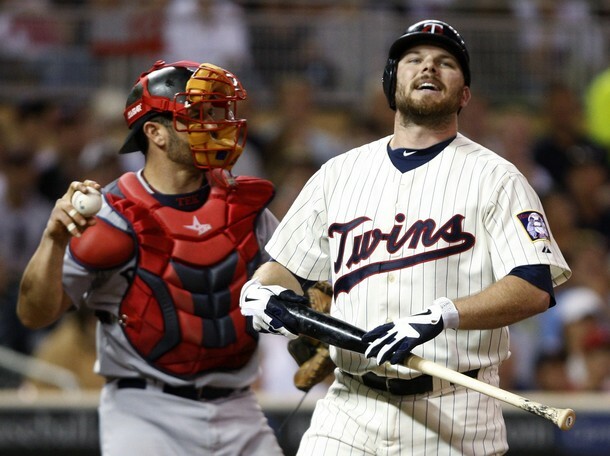 To his credit Kubel transitioned successfully from toolsy prospect with a blown out knee to lumbering designated hitter, batting .273/.339/.466 from 2007-2011, but much of his upside vanished that day in Arizona and sadly the Twins never got to see his full capabilities. We'll never know what he would've done with a healthy knee and uninterrupted development, but the player Kubel became following the injury was much closer to average than a star. He certainly had plenty of value, but poor defensive corner outfielders who hit .275 with 20 home runs and an .775 OPS shouldn't be terribly difficult or expensive to find for teams willing to use a platoon or at least go year-to-year with the role. And the Twins have basically done just that by replacing Kubel with Ryan Doumit, who'll make $3 million in 2012 and has a Kubel-like .271/.334/.442 career line with similar struggles versus lefties. Kubel perhaps has more upside than Doumit, but he also has less defensive versatility and would've required a multi-year commitment for more than twice as much money per year. Plus, by swapping Kubel for Doumit the Twins gain a supplemental first-round draft pick. Much like with Michael Cuddyer it would've been nice to see Kubel start and finish his career in Minnesota, but also like Cuddyer the Twins were able to replace him with a similar, arguably superior player for a fraction of the price while adding value in a draft pick. Smart decisions are often tough decisions and while a segment of the fan base is no doubt upset about Cuddyer and Kubel leaving the Twins made the right move in both cases. Glad Kubel was able to get a pretty good deal for himself. No way the Twins should have spent that much on him though, and they get a pick too. Too bad giving up a ‘proven closer’ wasn’t worth a draft pick. That aside, a good summation of Kubel and why the Twins were right to let him go, Aaron. UZR doesn’t even have numbers for Jones’ first three seasons in the majors and still rates him +15.5 runs defensively for his career. Pretty decent chance he’d be around +25 runs with those seasons included. That’s damn good. When the Twins signed Doumit, I thought Buterrible was being replaced. What the hell happened? Allways liked Kubel and especially Cuddyer…but these times are gone…and now we go on and get a good draft out there! Hope they also draft a great infielder and a new Torrii Hunter! Agree on Kubel (and on Cuddyer). I think the fact that you can’t trade draft picks in MLB affects how people evaluate these types of deals. If ever there were a deal we could send an aging (but decently productive) outfielder to another team for one or two 1st or 2nd round draft picks, most fans would understand that and support it. Well, that’s basically what we did, and in the case of Cuddyer, we got the draft picks, saved a little money, and more or less offset the loss of the bat by signing Willingham. The fact is that draft picks ARE valuable commodities in baseball, but fans don’t realize it because (a) They aren’t traded, so their value isn’t as discussed/understood; (b) Their value may not be realized for several years while the player makes his way through the minors; (c) The draft has several dozen rounds (which makes it appear more random, though the TOP prospects still have a pretty good chance of becoming MLB players of some type). Still, I understand the frustration at some fans over losing these players, and you can’t really say that they’re “wrong” just because Cuddy and Kubel became overpriced and there was more to gain by letting them go. I think part of the fans’ emotional reaction stems from the fact that Kubel was once a celebrated prospect and despite a few good years, he and the Twins never fully realized the promise that we hoped for when he was just a young player flailing away at pitches in the 2004 ALDS. It’s an empty feeling to see these guys leave for nothing when you know the team has little chance of actually improving next year, even if they’ll probably do better than 99 losses. I understand Aaron’s [and others] reasoning and I can live with it, provided the Twins use the money they saved with Kubel [and Cuddyer] and acquire a quality [not superstar] starter. I can’t complain about any of the moves Terry Ryan has made this offseason. Clearly this isn’t an “all in” season and meanwhile we have reduced payroll (hopefully providing some flexibility for future seasons)and will field a respectable club. 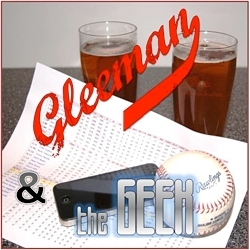 I am curious to read about the starters and relievers we will target. Thanks Cuddy and Kubs for the memories. Kubs, your GS for the cycle at the Dome was epic. Gleeman is correct, the best direction for the Twins at this time was to let them move on. In retrospect, they should have moved a TON of players last year before the deadline. Woulda, coulda, shoulda. 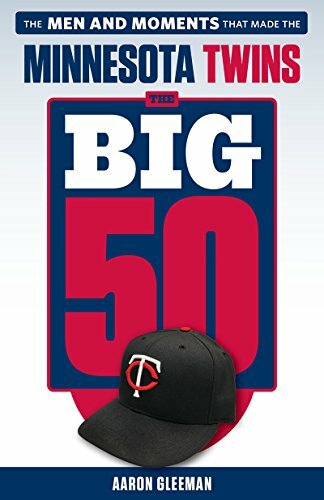 With Oswalt lowering his asking price and about $7 million left before they get to $100 million, is there any chance the Twins go after Oswalt, who is now reported to be seeking only a 1 year deal? Apparently he wants to prove his health so that he can get more money out on the market. And he should come cheap enough to where the Twins could still add a couple of moderately priced bullpen arms (thinking $1 or $2 million deals, Rauch/WHeeler/Hawkins types). It would be great to have another veteran presence in our rotation, and one that wasn’t quite as reliant on our defense as Pavano. If the Twins are terrible they can trade him through the season, if they are contending he is a potentially critical piece as a low-end number 1, and if he is hurt ideally they could recover some of the salary through either an insurance policy or an incentive-laden deal. Thoughts? When I saw that tidbit about Oswalt I thought the same, but from what I’m reading the speculation is that he’ll still want 10+ million for that one year. You also gotta think, now that he’s lowered his demand to a one-year deal that teams like the Yankees and others will be more interested and obviously the Twins won’t win in that scenario. Also, last year when the rumors were swirling over who the Astros would trade him to, wasn’t there something about him not wanting to come to Minnesota? A clause in his contract preventing it maybe? The Twins will trade for Brett Myers. Especially if they can get the astros to pay half his salary. The Twins will sign either Luke Scott or Johnny Gomes to complete the OF. As for the bullpen there are tons of options available.